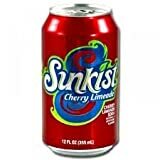 Sunkist is an orange flavored soda named after the popular citrus fruit brand, but is made by the Dr. Pepper/Snapple Company. 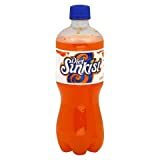 Most orange sodas are caffeine-free but Sunkist is an exception to this rule. Flavor and caffeine amount per 12 fl.oz. can. 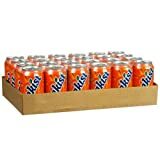 Carbonated Water, High Fructose Corn Syrup and/or Sugar, Citric Acid, Sodium Benzoate (Preservative), Food Starch-Modified, Natural Flavors, Caffeine, Glycerol Ester of Wood Rosin, Ascorbic Acid (Preservative), Yellow 6, Red 40. Sugar content: 52 grams (per 12 ounces). 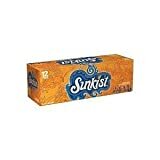 How Does Sunkist Orange Soda Compare? 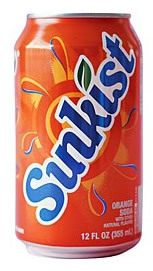 Sunkist Orange Soda contains 3.42 mgs of caffeine per fluid ounce (11.55mg/100 ml).